To make the pastry put the four and butter into a bowl and rub the butter into the flour to form a breadcrumb like mixture. Add a pinch of salt, the dried herbs and 2 tbsp of cold water to bind the mixture, you might need the third tablespoon of water if the dough is dry and not coming together but take care not to make it too wet. Mix thoroughly and kneed for a bit. Wrap the dough in cling film and leave in the fridge for at least 30 minutes. Place the butter with a little oil and the onions in a pan, sprinkle with the sugar and balsamic vinegar and cook over a medium heat for 10-15 minutes until the onion has caramelized, season if needed. To make the cheese filling, mix the egg with the milk and cheese in a bowl, season with black pepper and set aside. Keep a little of the cheese to sprinkle on top of the tart. 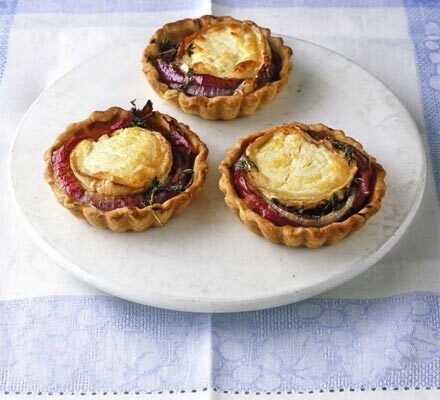 Remove the pastry from the fridge and roll out onto a floured surface then place in greased tart tins. You will need to blind bake the pastry, do this by placing greaseproof paper onto the tart and weigh down with dry beans, rice or baking beads. Bake in a preheated oven at 200 degrees for 15-20 mins or until the pastry has gone golden brown. When the pastry has cooked, put a layer of the caramelized onions and top with the cheese mixture and cook for a further 10-15mins at 180 degrees until the golden. this looks great! i may try this- but with premade dough.